Scope: Miami DEC 4-9th Check it out here! Don't forget to like my page on FACEBOOK! You'll be the first to get a glimpse at new work, upcoming shows, coupon codes & sale info! Check out My Etsy store for flasks, prints, and smaller works! A Washington DC native, Theresa Honeywell attended Montgomery College in 1995-1997, University of Georgia 2001-2005, and Arrowmont School of Arts and Crafts in 2004. After graduating with a Master degree in Sculpture, she began her artistic explorations of Pop art and Tattoo imagery. 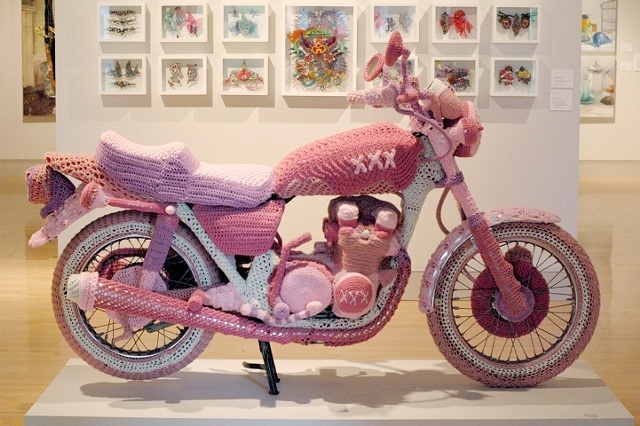 Using the traditionally feminine mediums of knitting and embroidery, she began to create a distinctly non-gender specific body of work that reflects her interest in low-brow art and macho tattoo culture. This dichotomy between art and craft, macho and feminine is where she finds her inspiration. Provocative imagery and macho icons are rendered into delicate and beautiful pieces of art that seem to question the notion of what art is, and what is only a handicraft. Her work is very labor intensive and densely rendered. She takes a craft that is considered to be pretty and merely decorative, and creates art that comments on our rigid notions of gender roles and high/low culture. Theresas work has been featured in various international publications, including W magazine, Nickelodean, Victim, Needled, and Make Magazine. Her work has been displayed in many galleries and museums from San Francisco and New York.